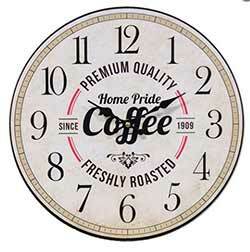 Decorative and functional, tell time in style with one of our clocks! 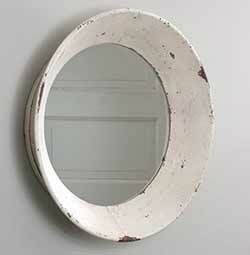 Or open up and brighten a room with one of our mirrors! 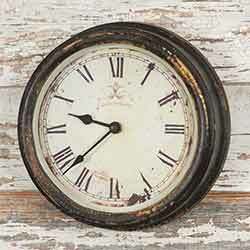 Styles to fit your vintage, country, primitive, or farmhouse home decor looks. 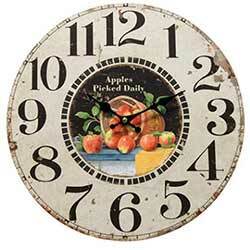 This decorative wall clock features retro style farm label style artwork depicting apples, and reads "Apples freshly picked daily." 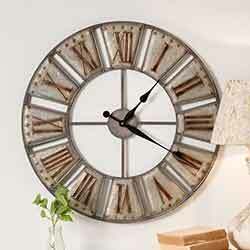 Make a statement with this oversized galvanized metal wall clock, featuring roman numerals and an antiqued finish. 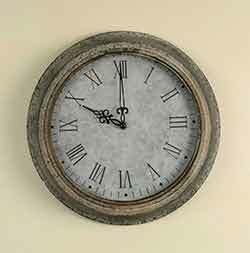 Give any room a sophisocated yet vintage vibe with this cafe-style wall clock, featuring a distressed and antiqued finish. his metal cabinet is useful on the wall or as a tabletop accessory, giving an industrial vibe to any room. 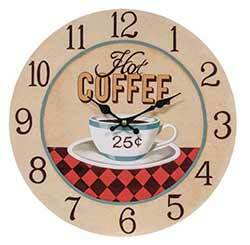 This decorative wall clock features retro diner style artwork designed by Dianna Swartz. 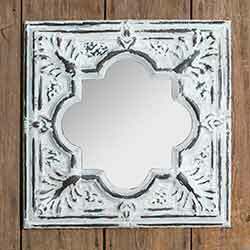 Mirrors are an effective way of opening up and brightening a room, and this distressed white version makes a beautiful statement. It's large size is perfect for an entryway, or above a mantel. 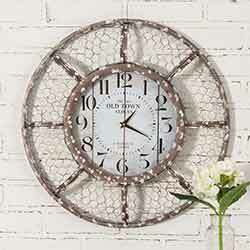 Make a statement with this overstize wall clock, featuring metal and chickenwire with an aged, distressed finish. 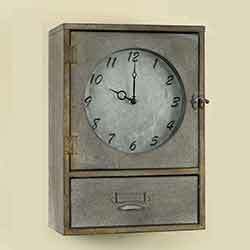 Features a galvanized face and a textured light grey frame for an indistrial vintage look. 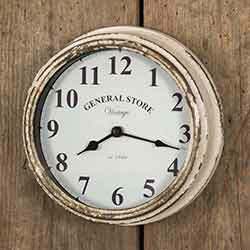 Features a distressed and antiqued finish reminiscent of old general store clocks. 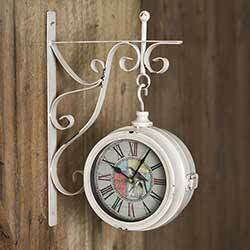 This nature-inspired clock is two-sided, and is detachable from its wall bracket. Reads "Joy in every day." 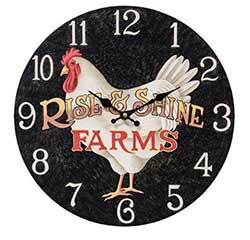 This decorative wall clock features rooster artwork, designed by Dianna Swartz for The Hearthside Collection. Reads: "Rise & Shine Farms." 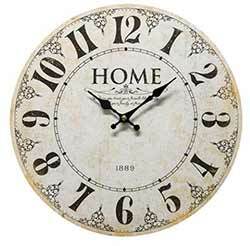 This decorative wall clock features vintage style scroll artwork and distressed look, and reads "Home." 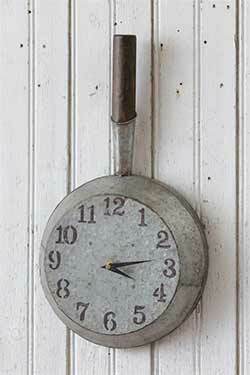 A vintage-inspired wall decor statement, our galvanized metal skillet wall clock will help you stay on time in your busy farmhouse kitchen! SPECIAL ORDER.